Phloroglucinol is an organic compound that is used in the synthesis of pharmaceuticals and explosives. It is a phenol derivative with antispasmodic properties that is used primarily as a laboratory reagent. Austrian chemist Heinrich Hlasiwetz (1825–1875) is remembered for his chemical analysis of phloroglucinol. Phloroglucinol is also generally found in the flavonoid ring A substitution pattern. Phloroglucinol (1,3,5-benzenetriol) is a benzenetriol, found along with two isomers, hydroxyquinol (1,2,4-benzenetriol) and pyrogallol (1,2,3-benzenetriol). Phloroglucinol, and its benzenetriol isomers, are still defined as “phenols” according to the IUPAC official nomenclature rules of chemical compounds. Many such monophenolics are often termed “polyphenols” by the cosmetic and parapharmaceutical industries, but they cannot be by any scientifically-accepted definition. This molecule has a unique symmetric arene substitution pattern of a trisubstituted benzene. It is a type of enol and exists in two forms, or tautomers; 1,3,5-trihydroxybenzene, which has phenol-like character, and 1,3,5-cyclohexanetrione (phloroglucin), which has ketone-like character. These two tautomers are in equilibrium. Phloroglucinol is a useful intermediate because it is polyfunctional. Furthermore, the deprotonated intermediate in the interconversion of the two forms, referred to as an enolate anion, is important in carbonyl chemistry, in large part because it is a strong nucleophile. From water, phloroglucinol crystallizes as the dihydrate, which has a melting point of 116–117 °C, but the anhydrous form melts at a much higher temperature, at 218–220 °C. It does not boil intact, but it does sublime. Phloroglucinol was originally isolated from phloretin, a compound found in fruit trees, using potassium hydroxide. Additionally, the compound can be similarly prepared from glucosides, plant extracts and resins such as quercetin, catechin and phlobaphenes. It is synthesized via a number of processes, but representative is the following route from trinitrobenzene. It is a selective trinitration where benzene is symmetrically trinitrated to 1,3,5 trinitrobenzene to produce a precursor for the synthesis of phloroglucinol. The synthesis is noteworthy because ordinary aniline derivatives are unreactive toward hydroxide. Because the triaminobenzene also exists as its imine tautomer, it is susceptible to hydrolysis. The compound behaves like a ketone in its reaction with hydroxylamine, forming the tris(oxime). But it behaves also like a benzenetriol (Ka1 = 3.56 × 10−9, Ka2 1.32×10−9), as the three hydroxyl groups can be methylated to give 1,3,5-trimethoxybenzene. The Hoesch reaction allows the synthesis of 1-(2,4, 6-Trihydroxyphenyl)ethanone from phloroglucinol. Leptospermone can be synthesized from phloroglucinol by a reaction with isovaleroylnitrile in the presence of a zinc chloride catalyst. Pentacarbon dioxide, described in 1988 by Günter Maier and others, can be obtained by pyrolysis of 1,3,5-cyclohexanetrione (phloroglucin). Methylation of Phloroglucinol results in 1,3,5-trimethoxybenzene (Phloroglucinol trimethyl ether), which in-turn finds an application in the synthesis of fraxinol. Phloroglucinols are secondary metabolites that occur naturally in certain plant species. It is also produced by organisms that are not plants such as brown algae or bacteria. Acyl dervatives are present in the fronds of the coastal woodfern, Dryopteris arguta or in Dryopteris crassirhizoma. The anthelmintic activity of the root of Dryopteris filix-mas has been claimed to be due to flavaspidic acid, a phloroglucinol derivative. Formylated phloroglucinol compounds (euglobals, macrocarpals and sideroxylonals) can be found in Eucalyptus species. Hyperforin and adhyperforin are two phloroglucinols found in St John's wort. Humulone is a phloroglucinol derivative with three isoprenoid side-chains. Two side-chains are prenyl groups and one is an isovaleryl group. Humulone is a bitter-tasting chemical compound found in the resin of mature hops (Humulus lupulus). Brown algae, such as Ecklonia stolonifera, Eisenia bicyclis or species in the genus Zonaria, produce phloroglucinol and phloroglucinol derivatives. Brown algae also produce a type of tannins known as phlorotannins. 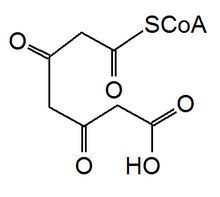 The bacterium Pseudomonas fluorescens produces phloroglucinol, phloroglucinol carboxylic acid and diacetylphloroglucinol. In Pseudomonas fluorescens, biosynthesis of phloroglucinol is performed with a type III polyketide synthase. The synthesis begins with the condensation of three malonyl-CoAs. Then decarboxylation followed by the cyclization of the activated 3,5-diketoheptanedioate product leads to the formation of phloroglucinol. The enzyme pyrogallol hydroxytransferase uses 1,2,3,5-tetrahydroxybenzene and 1,2,3-trihydroxybenzene (pyrogallol) to produce 1,3,5-trihydroxybenzene (phloroglucinol) and 1,2,3,5-tetrahydroxybenzene. It is found in the bacterium species Pelobacter acidigallici. The enzyme phloroglucinol reductase uses dihydrophloroglucinol and NADP+ to produce phloroglucinol, NADPH, and H+. It is found in the bacterium species Eubacterium oxidoreducens. The legume-root nodulating, microsymbiotic nitrogen-fixing bacterium species Bradyrhizobium japonicum is able to degrade catechin with formation of phloroglucinol carboxylic acid, further decarboxylated to phloroglucinol, which is dehydroxylated to resorcinol and hydroxyquinol. Phloretin hydrolase uses phloretin and water to produce phloretate and phloroglucinol. It is also used as a treatment for gallstones, spasmodic pain and other related gastrointestinal disorders. It has a non-specific spasmolytic action on the vessels, bronchi, intestine, ureters and gall bladder, and is used for treating disorders of these organs. It is the main ingredient of the drug Spasfon, commercialized in France, where it is one of the most sold drugs. Phloroglucinols acylated derivatives have a fatty acid synthase inhibitory activity. It has the A03AX12 code in the A03AX Other drugs for functional bowel disorders section of the ATC code A03 Drugs for functional gastrointestinal disorders subgroup of the Anatomical Therapeutic Chemical Classification System. It also has the D02.755.684 code in the D02 Organic chemicals section of the Medical Subject Headings (MeSH) codes by the United States National Library of Medicine. Phloroglucinol is mainly used as a coupling agent in printing. It links diazo dyes to give a fast black. It is useful for the industrial synthesis of pharmaceuticals (Flopropione) and explosives (TATB (2,4,6-triamino-1,3,5- trinitrobenzene), trinitrophloroglucinol, 1,3,5-trinitrobenzene). Phloroglucinolysis is an analytical technique to study condensed tannins by means of depolymerisation. The reaction makes use of phloroglucinol as nucleophile. Phlobaphenes formation (tannins condensation and precipitation) can be minimized in using strong nucleophiles, such as phloroglucinol, during pine tannins extraction. Phloroglucinol is a reagent of the Tollens’ test for pentoses. This test relies on reaction of the furfural with phloroglucinol to produce a colored compound with high molar absorptivity. A solution of hydrochloric acid and phloroglucinol is also used for the detection of lignin (Wiesner test). A brilliant red color develops, owing to the presence of coniferaldehyde groups in the lignin. A similar test can be performed with tolonium chloride. It is also part of Gunzburg reagent, an alcoholic solution of phloroglucinol and vanillin, for the qualitative detection of free hydrochloric acid in gastric juice. ↑ Roscoe, Henry (1891). A treatise on chemistry, Volume 3, Part 3. London: Macmillan & Co. p. 193. 1 2 Fiege, H.; Voges, H. W.; Hamamoto, T.; Umemura, S.; Iwata, T.; Miki, H.; Fujita, Y.; Buysch, H. J.; Garbe, D.; Paulus, W. (2000). "Phenol Derivatives". Ullmann's Encyclopedia of Industrial Chemistry. doi:10.1002/14356007.a19_313. ISBN 3527306730. ↑ Maier, G.; Reisenauer, H. P.; Schäfer, U.; Balli, H. (1988). "C5O2 (1,2,3,4-Pentatetraene-1,5-dione), a New Oxide of Carbon". Angewandte Chemie International Edition. 27 (4): 566–568. doi:10.1002/anie.198805661. ↑ I. Indian Insf. Sci., March-April 1994, 74, 277-285. 1 2 Na, M.; Jang, J.; Min, B. S.; Lee, S. J.; Lee, M. S.; Kim, B. Y.; Oh, W. K.; Ahn, J. S. (2006). "Fatty acid synthase inhibitory activity of acylphloroglucinols isolated from Dryopteris crassirhizoma". Bioorganic & Medicinal Chemistry Letters. 16 (18): 4738–4742. doi:10.1016/j.bmcl.2006.07.018. PMID 16870425. ↑ Eschler, B. M.; Pass, D. M.; Willis, R.; Foley, W. J. (2000). "Distribution of foliar formylated phloroglucinol derivatives amongst Eucalyptus species". Biochemical systematics and ecology. 28 (9): 813–824. doi:10.1016/S0305-1978(99)00123-4. PMID 10913843. ↑ Okada, Y.; Ishimaru, A.; Suzuki, R.; Okuyama, T. (2004). "A New Phloroglucinol Derivative from the Brown AlgaEisenia bicyclis: Potential for the Effective Treatment of Diabetic Complications". Journal of Natural Products. 67 (1): 103–105. doi:10.1021/np030323j. PMID 14738398. ↑ Blackman, A. J.; Rogers, G. I.; Volkman, J. K. (1988). "Phloroglucinol Derivatives from Three Australian Marine Algae of the Genus Zonaria". Journal of Natural Products. 51: 158. doi:10.1021/np50055a027. ↑ Shibata, T.; Kawaguchi, S.; Hama, Y.; Inagaki, M.; Yamaguchi, K.; Nakamura, T. (2004). "Local and chemical distribution of phlorotannins in brown algae". Journal of Applied Phycology. 16 (4): 291. doi:10.1023/B:JAPH.0000047781.24993.0a. 1 2 Achkar, J.; Xian, M.; Zhao, H.; Frost, J. W. (2005). "Biosynthesis of Phloroglucinol". Journal of the American Chemical Society. 127 (15): 5332–5333. doi:10.1021/ja042340g. PMID 15826166. ↑ "Phloroglucinol Summary Report" (PDF). EMEA. Retrieved 24 April 2009. ↑ Chassany, O.; Bonaz, B.; Bruley Des Varannes, S.; Bueno, L.; Cargill, G.; Coffin, B.; Ducrotté, P.; Grangé, V. (2007). "Acute exacerbation of pain in irritable bowel syndrome: Efficacy of phloroglucinol/trimethylphloroglucinol - a randomized, double-blind, placebo-controlled study". Alimentary Pharmacology & Therapeutics. 25 (9): 1115–1123. doi:10.1111/j.1365-2036.2007.03296.x. PMC 2683251 . PMID 17439513. ↑ "Intermediate Pharmaceutical Ingredients - Flopropione" (PDF). Univar Canada. Retrieved 24 April 2009. ↑ "Synthesis of trinitrophloroglucinol". The United States Patent and Trademark Office. 1984. Retrieved 24 April 2009. ↑ Sealy-Fisher, V. J.; Pizzi, A. (1992). "Increased pine tannins extraction and wood adhesives development by phlobaphenes minimization". Holz als Roh- und Werkstoff. 50 (5): 212. doi:10.1007/BF02663290.